Back when I was in high school, 5 years ago give or take a century, terrariums were all the rage. And they are all the rage again. Cool. Groovy. The bee’s knees, I tell you! I bought my Anchor Hocking cracker jar at Walmart for $5 and change. It comes in different sizes and this one is the large 1 gallon size (for those huge saltines, I suppose). I scuffed up the metal lid with sand paper and spray painted it to give it a more vintage look (I used Rustoleum’s Lagoon color). I have bought these jars numerous times over the years and always paint the lids and then all of a sudden they look like they came straight out of the 50’s. I added roughly 1/2 inch of stones on the bottom, followed by 1 inch of charcoal and topped by 2 1/2 inches of potting soil. Then I gingerly planted the plants, set my Adirondack chair and purple martin birdhouse up, misted the foliage with a little water and screwed on the lid. I don’t expect to have to water it again for a few weeks, if not a few months. A few years might be pushing it. Wouldn’t these make a great Mother’s Day gift? Add a box of wine and a card and you’re all set. Those are cute! I’d keep the box of wine & just add the card, though. I love those jars. Just the laugh I needed today with the “Box of wine” line! We had one in our fridge growing up, right next to the 2 gallon box of milk! 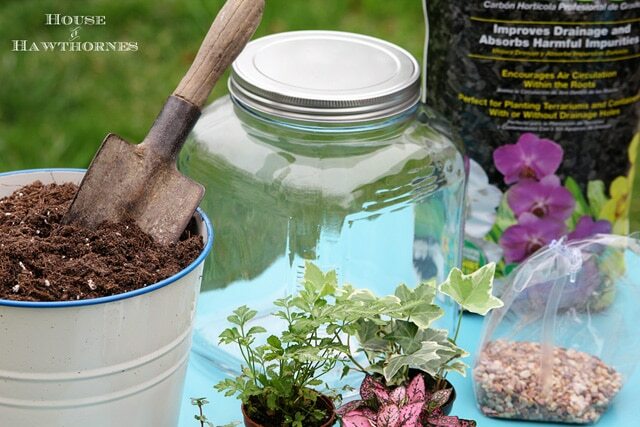 I remember making terrariums, too (I’m so retro I just bought an African violet) and love the idea of the jar! Love this and have to ask where you got the mini chair and birdhouse. This is clever, indeed. Where do you get the doodads? Very cute. I thought it was a vintage jar at first. Do the plants grow fast in there? Pam it’s adorable. I love it. 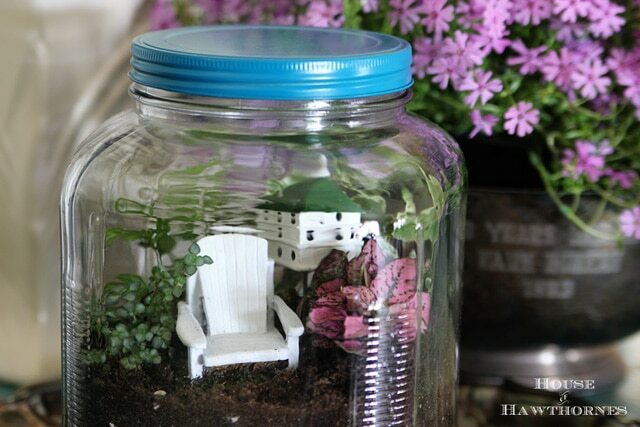 great tip on painting the jar covers, I have a few of those jars haning around. Can’t wait to paint the lids a bright, cheerful red! So very cute! Love the chair and birdhouse. Very cute – where did you get those cute embellishments – love the chair and birdhouse! So darn cute and I love the painted lid. Just wondering though, how do the purple martins get in? I’m starting to see these all over as well. Love the chair and the little plants. So pretty for Spring! To answer the questions about my doodads – the mini Adirondack was one of those fairy garden pieces of furniture. The chair is resin and originally was brown, but I painted it white. And the purple martin house was one of those plant sticks that you’d decorate a plant with if you were giving it as a gift. It’s resin too and then I just clipped off the extra stick part to make it fit in the jar. I bought them both at a fancy garden center here in Columbus, but I would think any larger garden center would have similar pieces. Adorable!! 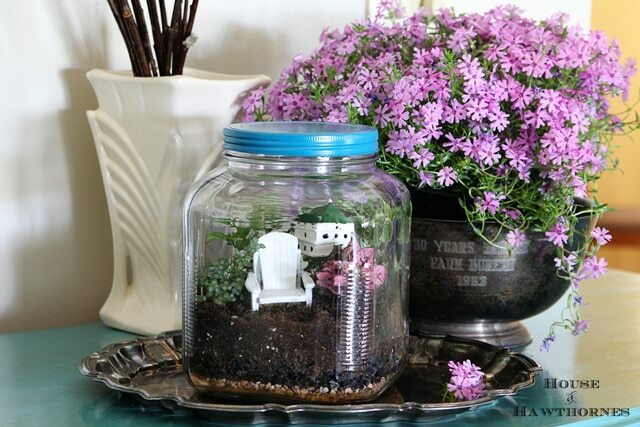 I sure do remember the terrariums of yesteryear, so happy to see them coming back with a vintage twist. I love it!! Looks adorable. I must try making one. I so remember making lots of them, then making macrame hangers for them and gave the out for any possible occasion. Oh I wish you could come to my house, so that we could do this project together cause somehow I know I would ruin it. I wish I was as crafty as you.. I might just do this for my mom. 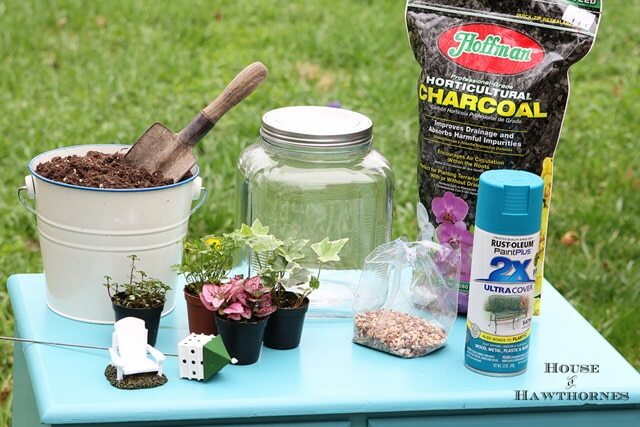 Did you get the doodads at a garden center. I did think it was an old jar. Thanks for all the instructions. Adorable! I have old jars like yours that my family hates. I used them as cookie jars and the lids always got stuck so sneaking cookies was next to impossible. Maybe they’ll each get a new jar with a painted lid for Christmas. Great idea! That little chair and birdhouse are too cute! This is such a pretty project! My 10 year old daughter would absolutely love to help me make something like this. What a wonderful gift idea too! 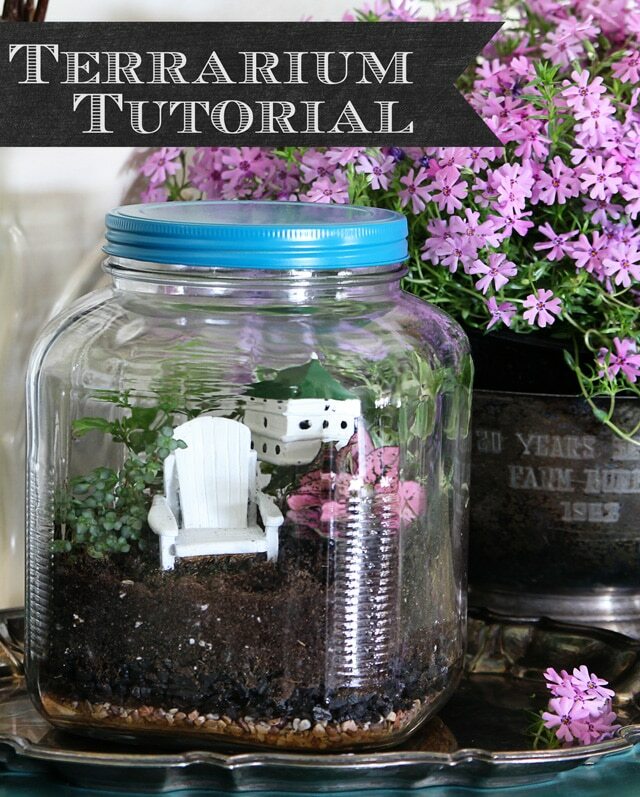 This is such a cute terrarium. 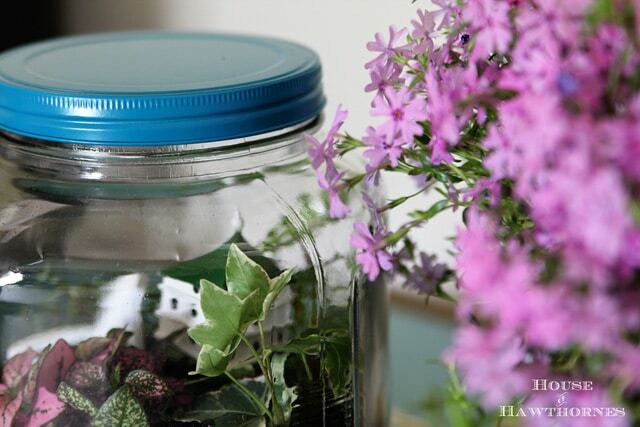 That jar makes the perfect container. I love the way you “retro-ed” it with the blue lid, and the furnishings are perfect. 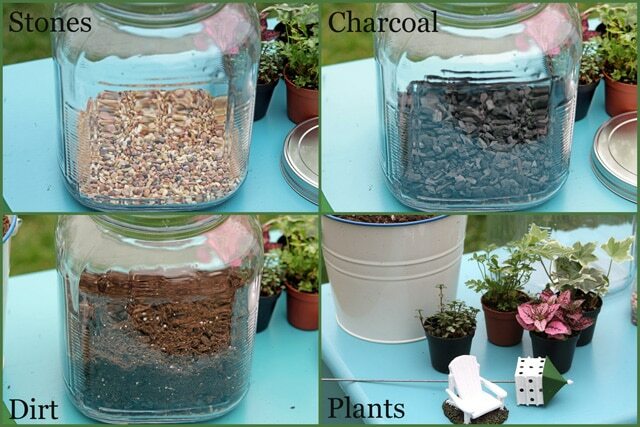 I so like the way you made this terrarium. Maybe I will try this. Pam I love this! In fact I wanted to make a special birthday gift for a girlfriend this weekend and this is perfect. You’re so creative! I ordered a gnome, a 5 in. trellis, and little mushrooms from eBay to decorate mine. They have a lot of cute little minis that would work. What a fun idea! We featured your post on our facebook page…with a link to your blog. Thanks. This is so cute! I missed this post! I would love to try this someday. Adorable! This would be a fun project for me and my Granddaughters…they love helping in my garden and this would be an added bonus! Thanks for sharing! I’ve been looking for some interesting Spring centerpieces for my home – thanks for the inspiration! I love it with the little chair, very cute! I helped the kids make a dinosaur garden years ago that was similar & came out pretty good, then everything grew so much we couldn’t even see the dinosaurs – better than everything dying off though I suppose! My dad gave me a terrarium kit left from the 70s about 5 yrs ago. The plastic bulb was too big for my little house, (more than arm’s width around) so I took it to work. I work with adults w disabilities and we made it a group project. I went back & saw it ‘recently; they’d made it a finished wooden base (wheelchairs are heck on plastic when running into it) and it is showcased in the lobby! Now I want to make more!